This entry was posted in HRO Today, Magazine on April 18, 2019 by Audrey Roth. 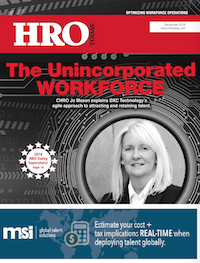 This entry was posted in HRO Today EMEA, Magazine on April 11, 2019 by Audrey Roth. This entry was posted in HRO Today, Magazine on March 21, 2019 by Audrey Roth. This entry was posted in HRO Today Global Archives, Magazine on March 12, 2019 by Audrey Roth. This entry was posted in HRO Today, Magazine on February 12, 2019 by Audrey Roth. This entry was posted in HRO Today Global Archives, Magazine on January 2, 2019 by Audrey Roth. This entry was posted in HRO Today, Magazine on December 18, 2018 by Audrey Roth. This entry was posted in HRO Today, Magazine on November 15, 2018 by Audrey Roth.